STRUGGLING to make sense of exactly what's happening in Syria? Its war-torn streets are a confused three-way interplay of conflicting secular and Islamic factions, but one hand seems to be lurking ominously behind it all. Iran is not only backing Syria's President Assad, but also through the complex interplay of the Middle East it is also supporting many of those who are fighting against him. It's an environment of warring Islamic factions - Sunni v Shiite. It's also a battlefield of Islam versus Christianity, religion versus secularism and rich versus poor. Add to all this the unevenly distributed oil wealth of the region, and you get the mess we see today. It is this complex web of "good guys v bad guys" that makes a decision to take sides even more complex for the West - of which Britain has already baulked at the prospect of another drawn out and confused war in the vein of Iraq and Afghanistan. If the US takes sides, who will benefit? Arming the rebels will end up assisting the likes of Al-Qaeda. Ignoring Assad means allowing Iran to have its way. In fact, whatever the outcome, only Iran seems set to benefit the most. So just how do the sides stack up? President Assad: Besieged Syrian dictator President Bashar Assad's Syrian Army has been regaining ground in recent months. The army, while split by the civil war, still boasts a force of some 300,000 soldiers along with a credible force of modern Russian supplied fighter aircraft, tanks and anti-aircraft systems. Amid the ongoing fighting, both President Assad and his opponents have been accused of resorting to the use of chemical weapons. These allegations have proved a tipping point in the eyes of the West. After years of reluctance in actively taking sides, the use of weapons of mass destruction has set the United States firmly against Assad - despite his protests that the attacks were a political ploy by his retreating opponents. Russia risks losing its last major Soviet Union-era naval base in the Mediterranean Sea if the Syrian regime is overthrown. To support President Assad, Russia has been feeding the Syrian Army with equipment and training while riding shotgun in representative bodies such as the United Nations Security Council. Also adding to the mix is Lebannon's Iranian-backed Hezbollah which provides significant materialsupport for Hamas in its struggle against Israel. Hezbollah is sending its troops and supplies over th border to back Syria's Shiite population. A force claiming some 80,000 fighters, the grand name masks the true mix of militant radicals and secular separatists that would otherwise be shooting each other instead of their common foe. The FSA is largely made up of elements of the Sunni Wahhabis Islamic movement. It is the most internationally acceptable body and, as such, tends to be the organisation through which foreign aid is distributed. It also counts Saudi Arabia and Qatar as its key backers. While fighting under the Free Syrian Army banner, this confused faction is united only by the common goal of increasing the influence of Islam and getting rid of Assad. It claims to have a force of 35,000 men. This is another large alliance of Syrian rebel factions, this time among those of the Sunni Salafists Islamists. It claims to have 25,000 men-at-arms and appears to be more internally disciplined than other Syrian rebel factions such as the FSA. However, the SIF is demanding the formation of an Islamic state with sharia law. This group appears to be more internally disciplined than other Syrian rebel factions. This Palestinian body - backed by Hezbollah and Iran in its struggle against Israel - has thrown its weight behind many of the factions fighting against President Assad. This international network of extremist Islamic terrorists is the most extreme element of the radical Sunni group. Its members in Somalia, Yemen, Pakistan and Iraq all provide support in the form of manpower, money and weapons. Egypt's Islamic support base of Egypt's deposed US-backed President Mohamed Morsi - the Muslim Brotherhood - has been using its international network to support several rebel factions in Syria - including Hamas. Shiite Iran has been making overtures to this largely Sunni movement to support the growing popularity of Islam within the North African country. The United States and its key Western allies finds itself in an unenviable position when it comes to taking sides. Many rebel groups represent a repressed ethic and religious majority within Syria. But many also represent terrorist organisations against which the West has been struggling for decades. President Obama has now clearly chosen to throw his weight behind the Syrian rebels - particularly now US intelligence agencies have been convinced chemical weapons have been used against them. As the largest Shiite Muslim power in the Middle East, it is striving to maintain the ascendancy of this religious faction within Syria's borders. While providing men and equipment to help prop up President Assad, the Islamic state has threatened retaliation against Israel if the West launches any attack on their ally. But it also seems to be having a bet each way. While openly supporting the regime backed by the same Shiite Muslim beliefs as itself, Iran's broader support for the ascendancy of militant Islam in all its forms throughout the Middle East seems to be fuelling the cogs of war on both sides of the Syrian conflict. On one hand it is openly sending mujahideen fighters, cash and equipment to support Assad's Syrian Army. It's puppet Hezbollah organisation in Lebanon is also fighting alongside Assad's forces. On the other hand, its support for Hamas and to a lesser extend the Muslim Brotherhood, it can be said to be materially supporting many of those rebelling against the Assad Presidency it openly backs. The Gulf States want to pay the US to get involved, so that means we go in on the side of the Wahabis and the Salafists, both of which hate the US. 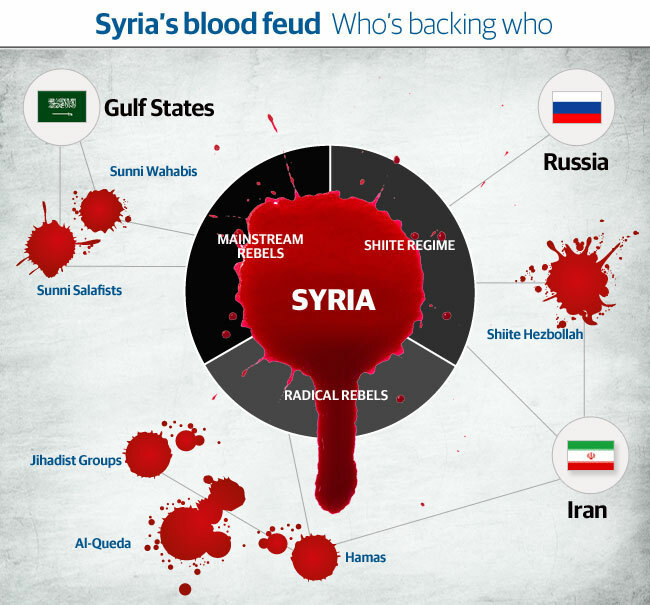 Good post and an excellent chart/portrayal of who is involved and who is backing them..
My tag line should be the official policy/stand of the US for at least the next 100 years, when feral Islamics are killing each other. I agree. Let all the sides in this conflict weaken each other, and then, if the US wants to, walk in and clean up the WMDs so NO ONE has access to them. Here's all you need to know about Syria. A minority of 26% of the population is allied with Assad: Alawite Muslims (Assad's tribe), Druze Muslims, Shi'ite Muslims, Christians. This 26% minority runs Syria. The 74% majority out-of-power are Sunni. The anti-government rebels are being encouraged and funded by Sunni states like Saudi Arabia and the Gulf nations. Obama has sided with the Saudi-backed Sunni rebels. The Iranians, Russians, and Chinese back Assad. If Obonzo is stupid enough to attack, he might trigger a major war with Assad's allies and that's the real danger the idiots inside the DC Beltway are ignoring or downplaying to appease this lying POS (and his brain, Valerie Jarrett) in the White Hut. Good rundown. Does your analysis pretty much agree with the chart at post #1? Thanks for your short/clear/concise reply. It goes very well with xzins's chart. All we need to know now is who is paying Obozo, Biden, the rats, McAinal etc to bomb Assad. Cui Bono, or who benefits! To answer your question: the graphic is pretty accurate, but fails to address the major issue of the war between Sunni vs. Shi'ite Muslims that's been going on for 1,400 years. All of the factions in this 3-way pie either support the Sunni or Shi'ite factions. The graphic indicates that Iran may be playing both sides of the fence in this 3-way pie. I don't know if they are, but Iran can be bipolar at times. However, 2/3 of the rebels fighting Assad's regime are Sunni (or are aligned with the Sunnis) and that includes both Mainstream and Radical Rebels.